In our last post, we discussed the role that influencers and other channels have in helping drive millennial women to purchase apparel and accessories. As part of our POPSUGAR Future of Retail Experiences study, we also asked women to think back on their past experiences and share with us the sources of inspiration they find themselves relying on now more than they did a few years ago. Using that lens, we were able to learn that the role of individual influencers has grown dramatically over the past few years as new digital and social channels emerge and the consumers have the ability to obtain insights related to fashion and style within their daily feeds. The walls between the experts and those that seek expertise have fallen, and the exchange of ideas and information can flourish. Overall, 63% of millennial women say that they rely on influencers more now than a few years ago. The distribution between celebrities (22%), topic area experts (21%), and bloggers/Instagrammers/YouTubers (20%) is relatively close, showing that the relative influence of each has risen over the past few years. After influencers, 46% of millennial women said that the influence of physical stores (22%) and shopping malls (24%) has risen in the past few years, despite many media headlines touting the death of offline shopping and shopping malls. In the past few years, stores and malls have heeded the advice of many to find reasons for consumers to visit their stores; from discounts and deals to providing exclusive in-store shopping experiences, many stores have found a way to evolve and adapt to the new climate and many millennial women seem to have noticed. Similarly, individual retailers and retail brands have increased their influence among millennial women in the past few years. 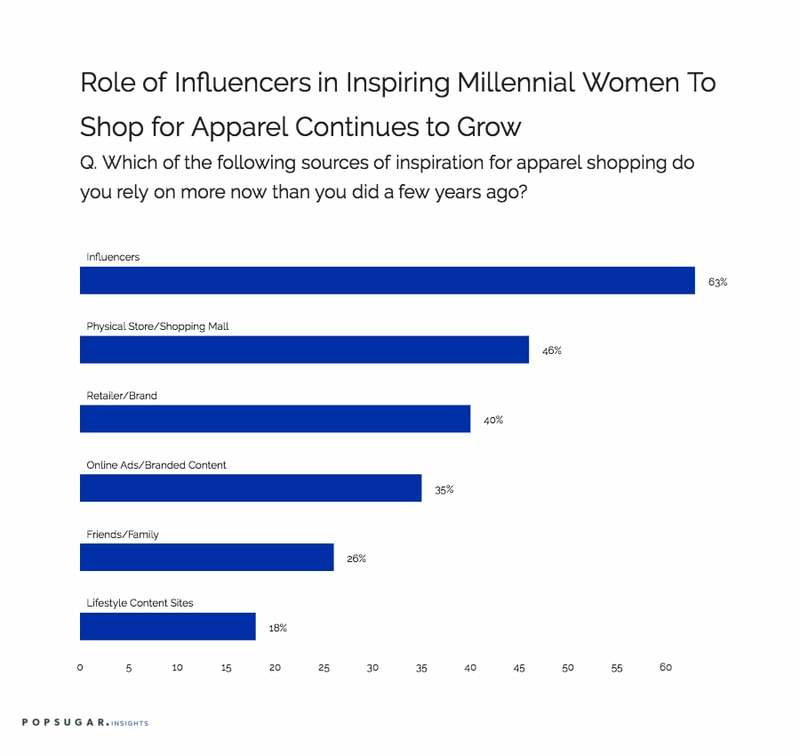 Overall, 40% of millennial women say they are more influenced by retail brands now than in the past few years, and specifically by a retailer's website (21%) or their social media efforts (19%). Connected to that effort is a brand's investment in online ads and branded content, which 35% of millennial women cited as being more influential now than a few years ago. Again, the evolution of digital content as a messaging and marketing platform and as a way to deliver value to a millennial consumer is a key driver of this rise in influence.